With the potential I was only going to be home a week, I went grocery shopping at a warehouse store figuring out how I could eat for a week and be lazy. I purchased mostly salad stuff, a large filet of salmon and a package of precooked pasta and chicken in a that is reheated in the Microwave. 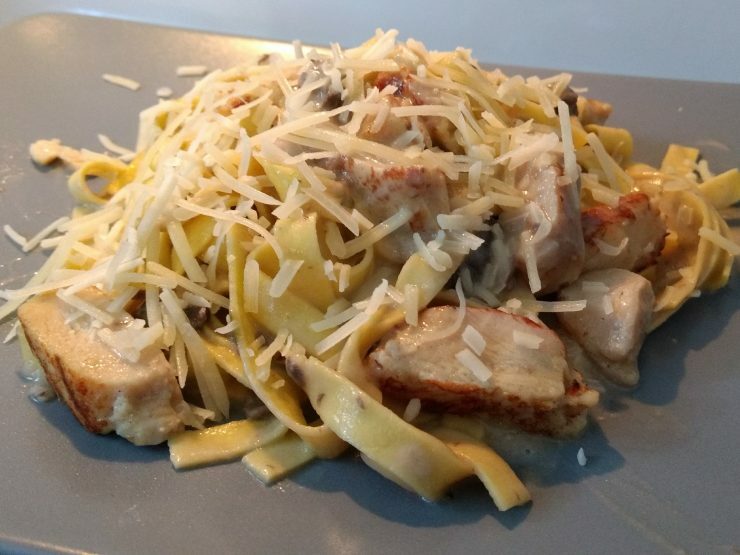 This package is the Rana Tagliatelle Grilled White Chicken & Portobello Mushroom Sauce. Normally I do not buy food specifically made to be reheated in a microwave, but at $6.99 at Costco for 3 meals (package says 7 servings) I figured I’d give it a shot. This was surprisingly easy to make. The pasta, chicken and sauce are all precooked and packaged separately. The package even came with the microwave safe bowl for those people who don’t have or like cleaning dishes. The steps were so simple; put pasta in the bowl, pour sauce on top, top with chicken, cover and put in microwave to cook. 8 minutes later, I actually had food that looked like something edible. My end product I covered in some parmesan for a little more flavor. In the end, it was pretty good. Pasta was pretty close to al dente. The chicken wasn’t dry or rubbery. The mushroom sauce was flavorful, although maybe a with a little too much salt. Would I eat this again? Sure, it was a package with about 3 servings my size so I was at least having it for 2 more meals. Would I buy it again? Maybe depending on the price. On the second eating, I did make some broccoli with it too so there would be a real vegetable with it. The meal definitely tasted OK enough to eat again. It was a great alternative to actually putting in effort to cook.